Associated PressA worker restocks cream cheese at a Whole Foods in Woodmere Village, Ohio. Whole Foods is expanding and expects salesto increase by 9% next year. But as the organic grocery thrives, traditional supermarkets are losing market share. Customers are seeking either specialty assortments or great value, according to a recent report by the real-estate investment firm JLL. 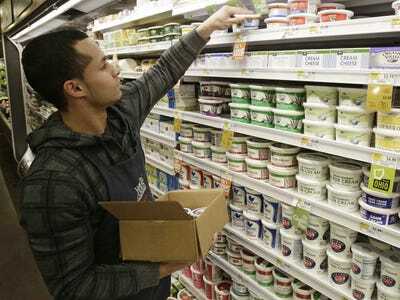 While high-end grocers like Whole Foods and cheap retailers like Family Dollar will expand in the coming years, traditional grocery stores like Kroger, Giant Eagle, and Publix could close stores. Supermarkets are hit hard by a few trends, according to the report. Since the 2008 recession, consumers have been reluctant to pay full price for items. This led to dollar stores expanding their food assortments to include brand names. Meanwhile, those who do want to pay more want the organic, artisanal assortments grocers like Whole Foods have to offer. “Millennials and Boomers alike are focusing more on healthy eating choices and creatively prepared meals,” the analysts write. This puts grocery stores, which fall somewhere between organic retailers and discounters, in a difficult position. 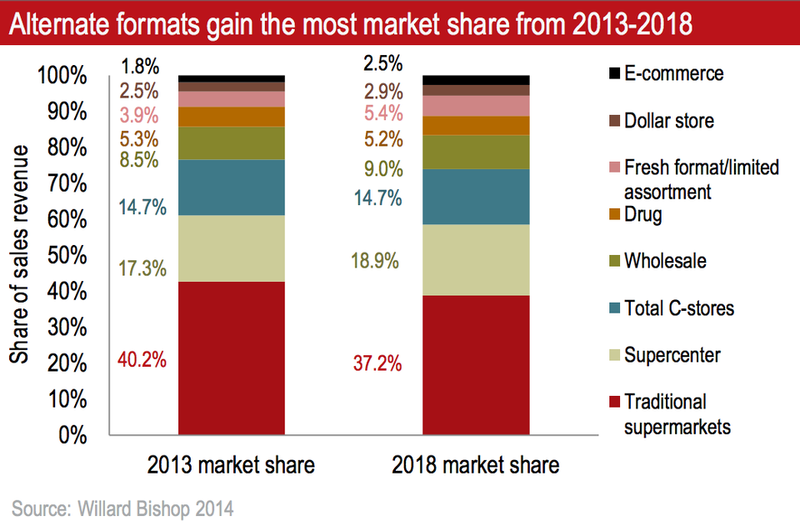 JLLAlternative retailers are taking market share from grocery stores. Consumers are also buying groceries from several different places, including online. This gives smaller and specialty retailers an advantage over supermarkets. Consumers are also becoming less interested in retailers like Wal-Mart and Target, according to a recent note by Goldman Sachs. Instead, “consumers appear more focused on some combination of value and convenience,” the analysts write. The advent of online retailers like Amazon has also contributed to the problems at Wal-Mart and Target, according to the note. Consumers are less likely to make a trip to the stores when they could get free delivery online. Dollar stores, drug stores, and warehouse clubs “are taking share from broad-assortment retailers,” the analysts write.